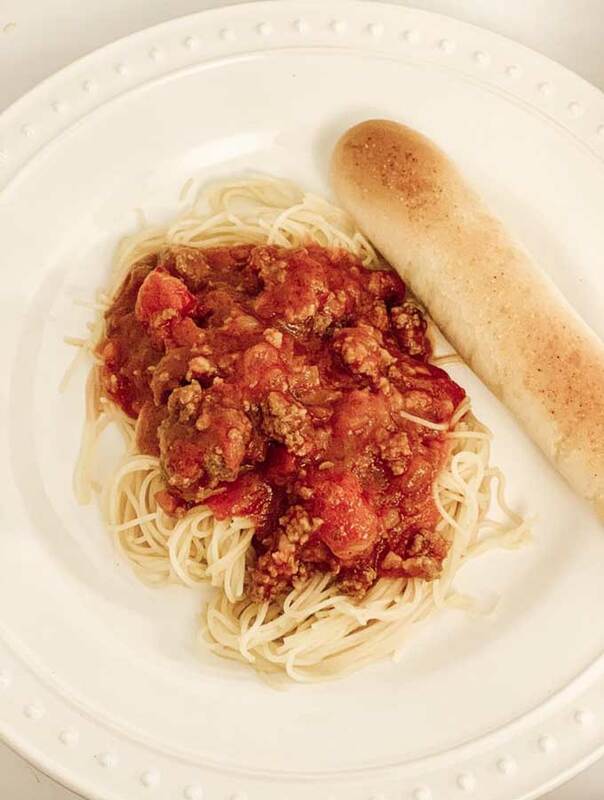 Are you all ready to hear about Tom’s Famous Spaghetti Sauce with Meat-Hallstrom Home? 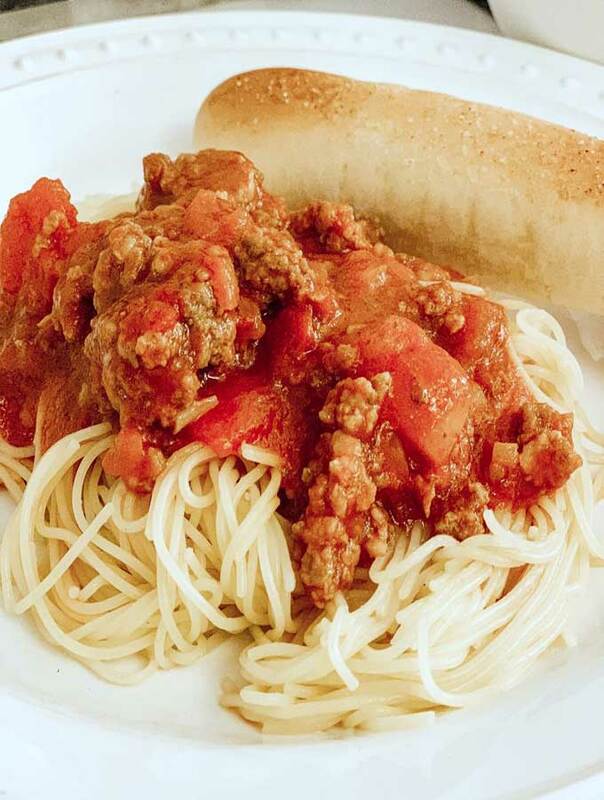 If you follow me on Instagram, you know this is our now our favorite new spaghetti recipe. Our good friend Tom gave us this recipe. It is just so good I need to share it with you all. Now Tom is a master in the kitchen, so anything he is cooking up is amazing. This recipe will be loved by all, trust me on this one. With 7 kids not everyone is enjoying the meal, but with this recipe they keep going back for more! Eating with 7 kids can be hard, so many times they are not on the same page about a dinner. But for all of the kids this gets a 5 star rating! 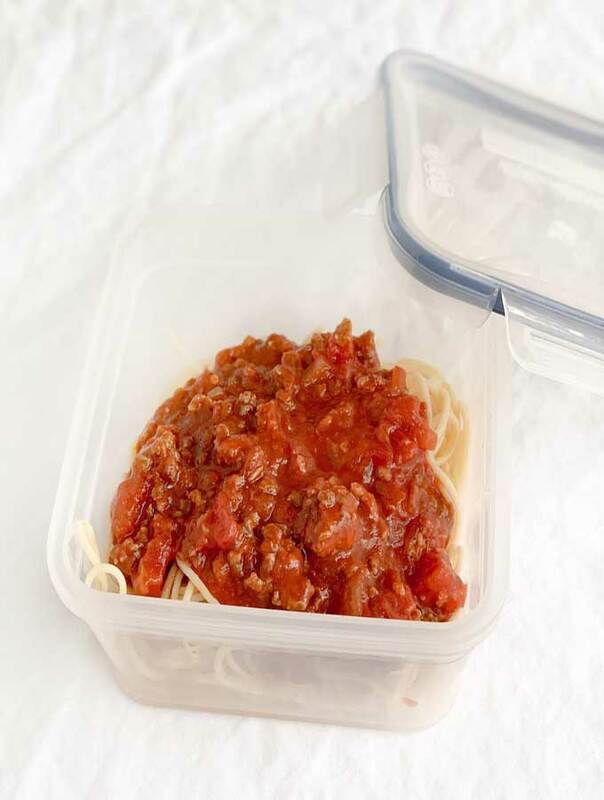 This easy spaghetti sauce is so quick and delicious. There is a trick, you need to follow the directions exactly. Otherwise you just won’t get the same amazing taste. When I mean follow them exactly, I mean down to the brand as well. This is a great recipe to add to your basic meal planning. To begin you are first going to want to cook up the meats, then add your red pepper flakes. These add just the right amount of spice, so if you like yours a bit more spicy go ahead and add more. Next in a separate pan you’re going to saute the onion, garlic, and basil. Add that to the meat once it’s done. For the short amount of time this sauce cooks, it is so flavorful. We can share with you a shopping guide on how to set up the table for serving this yummy meal, it’s something special. There is a Hearth and Hand by Magnolia guide to shop for your home. The next step is very important. 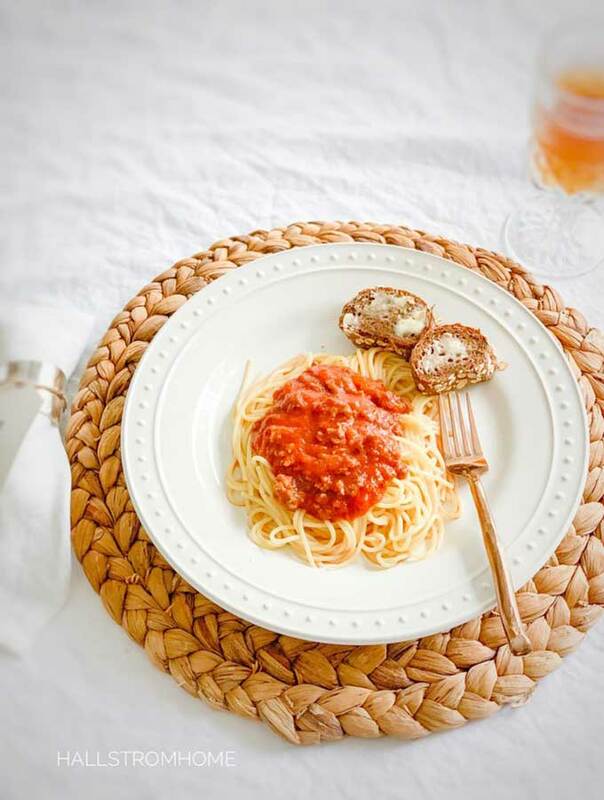 You have to use Hunt’s Tomato Sauce, because this brand is the best for this recipe. I have noticed that I enjoy name brand foods much better than the store brand. Tom told us to follow the recipe exactly and that is what we’ve done. Boy has it turned out great. It’s up to you if you want to change it up, but I just don’t think it will have that same great flavor as Tom’s recipe. For this recipe I use angel hair noodles. They are really quick to cook and this sauce works great with thin noodles. I will share with you another yummy recipe for a slow cooking sauce. 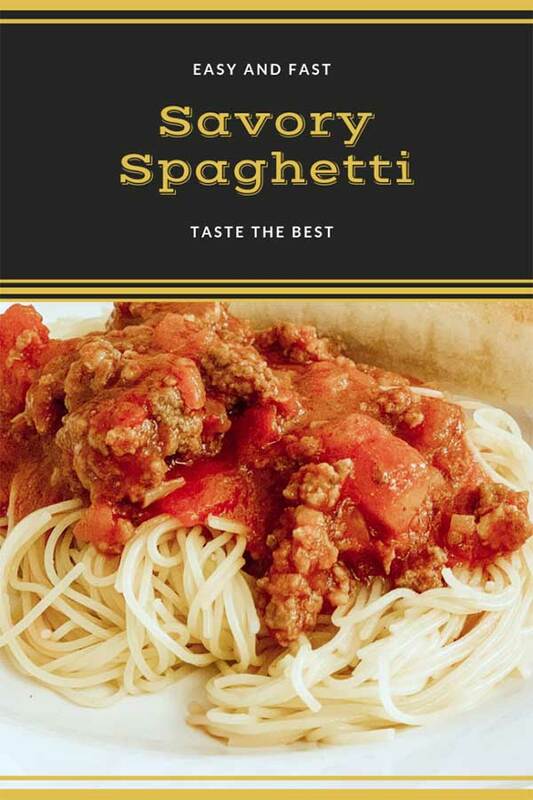 This is the best homemade spaghetti sauce with meat. It comes from our great friend Tom who is awesome in the kitchen. Fry your hamburger and Italian sausage in a pan. Drain the grease and add the red pepper flakes. In a separate pan saute the onion, garlic, and basil with lots of oil. Once that is done add this mixture to the meat mixture. Add the large and small cans of Hunts Tomato sauce. Add in your fennel seed and garlic salt. To the sauce we add the garlic salt and fennel seed. 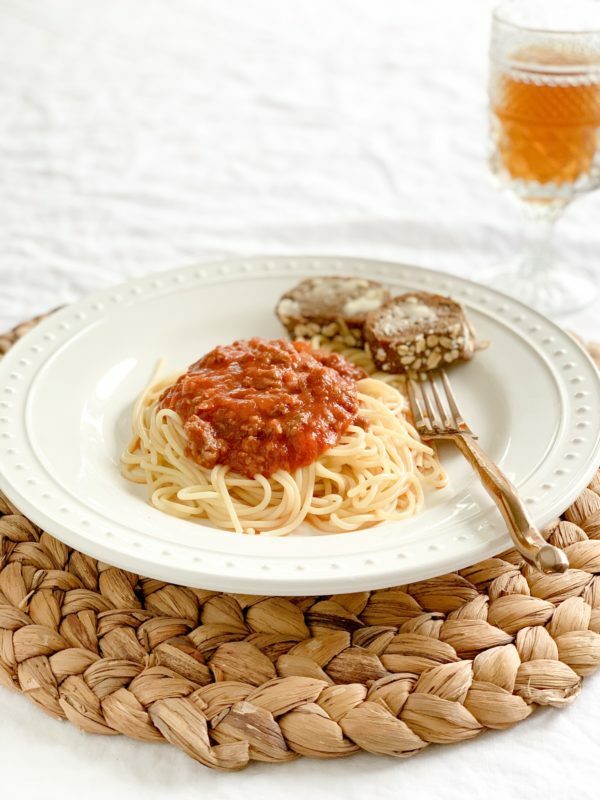 The fennel seed and basil is what really gives this spaghetti meat sauce flavor. With 7 kids, they don’t want the fennel to over power so we stick to the 2 tsp measurement. You can add more if you desire, but do it very slowly and keep tasting to make sure you like it. Something else that can really alter the flavor of your dish is the freshness of your herbs. I like to make sure mine are fresh to get the best use of flavor. Using freeze dried basil is the best, that’s what I use and it’s so easy. If you’re looking for another cold day meal I have a great creamy potato hamburger soup. Can you freeze the spaghetti meat sauce? Yes you can. Use it within four months for the strong flavor. Of course, just get some spaghetti noodles that are gluten free. Also the sauce has no gluten, so you are good there. Do you have to add the meat? Nope. This can still get pretty flavorful without the meat. Can I use turkey meat instead of beef? Sure. The turkey meet won’t alter the flavor too much to notice. This looks delish, I’m very excited to try this, I dont usually use fennel so this will be fun. Thanks to Tom.for sharing. It looks to me.that the photo has some pieces of tomato in the sauce ,but the recipe just calls for cans of sauce. Just want to be clear. Also do I use a whole bulb.of garlic? Not clove or cloves ? Thanks Rhonda, also I’ve been enjoying going thru the soup recipes ! Fennel adds so much more! It uses cans of Hunts tomato sauce, so there are some chunks. Yes a garlic bulb, it add a lot of flavor! I am glad you’re enjoying the recipes. Hope this works out! Ya’ll Gotta make this sauce. It is so easy to make and SOOOOO good! It even beats my family heirloom recipe!! Thx! It is just too good!! I’m going to try it this weekend…Thank you Sweetie, for sharing. I know it’s just so delicious. You’ll have to let me know how it goes! Tell me how it goes Meloney! It is super delicious!! Yum!!! I will definitely try Tom’s sauce!!! Tell me how you like it Janel!